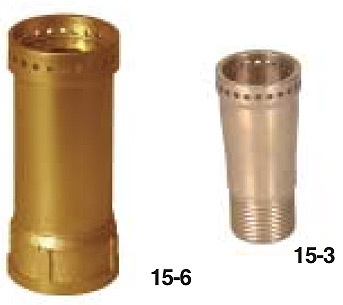 Curtain nozzle and lace holder, consisting of nozzle body, lower body washer and upper slip on lock ring, all made of brass. 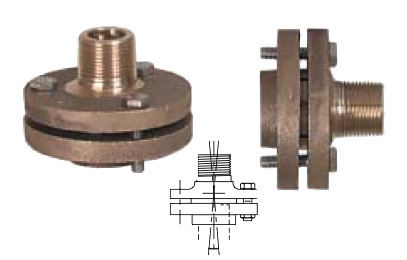 The nozzle body has a UNF 0.375" x 24 TPI thread (if necessary a tap drill and tap can be provided at cost). The nozzle body is normally threaded from the top into a stainless steel trough (#4) (by others). The curtain lace is fed through the nozzle from the bottom up into and through the slot in the top of the nozzle and looped over to one side, then the lock ring is slipped over the lace and top of the nozzle, locking the lace. The slot in the top of the nozzle to align with the row of nozzles. The bottom of the nozzle must protrude beneath the pan by a minimum of 0.125" to prevent the water from spreading out horizontally causing overspray and splash. Curtain Lace is made of stretch resistant, near unbreakable, clear mylar plastic of 0.010" thickness and 0.156" width. Lace is supplied in bulk length , ranging from 200' to 500' as available. Add 10% to length of lace for ends. As all impurities in the water , mineral or otherwise will cling to the lace and discolor it , Curtain Fountains should be operated with filtered mineral free water if they are to retain their beauty for any length of time. Lace Weight, Cast Bronze Weight for each lace of app. 1.160 lbs. This weight is normally sufficient for heights up to 33 feet, therefore when hung in angles, increase the weights until the lace is as taut as a violin string . Normally , similar weights are obtained locally from fishermen or others. Commonly made of stainless steel at least 3mm - 0.125" thickness, 4" width & height, material must permit nozzle to protrude at least 0.125" beneath the trough . With screw type turnbuckle suspension to permit Horizontal adjustment of entire trough. The trough to have access from above for installation and must have on opposite sides overflow tubes (0.50"). The water depth usually is 0.750 - 1.000") over bottom of side opening in nozzles . Water supply into trough must be even and is best through a plastic pipe laid over nozzles with 0.125" holes on 1.500" centers at the 1700hr and 1900 hr position in the pipe. Water flowing over or through the nozzles will disrupt nozzle discharge and must be avoided. Usually made of clear acrylic plastic (Plexiglass) app. 0.75" thick x 2-4" width, the spacer bar rests on the lace weights. Holes for laces(0.250") to pass through, must be drilled together with those in trough, then saw - slip-ins at 90 degrees angle from the side. Normally the curtain weights are tied to lace first then the lace is slipped through the slip in into its hole in the spacerbar. As nozzle slots in trough are parallel to row of laces, the slip ins are at 90 degrees to same, the lace normally is locked into its hole in the spacerbar. These are cut from 0.010" clear or black electrical tubing , 0.375" inside diameter cut to length to rest on spacer bar and extend appr. 0.500" above waterlevel. 2 x V shape angle to be cut into lower end of tubing to permit larger outflow than inflow. 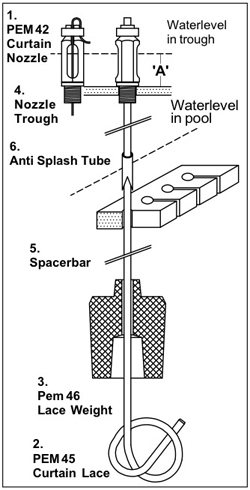 The anti splash tubes are used for water curtains in very narrow base pools to avoid splash.